Following a long and tense wait for the 2018 nominees, since the final shoot-out on October 24th, Caolán Irwin was announced as the recipient of the 2018 ‘Young Racer of the Year’ title at the Dunlop Masters Superbike Championship awards ceremony at the Westgrove Hotel in Clane, County Kildare on Saturday night, November 10th. Irwin, from Donegal, follows in the footsteps of previous winners, Jason Lynn and Robert English as he picks up a prize package of support worth more than €10,000, to assist him in furthering his Motorcycle Racing career. Caolán Irwin began 2018 with the aim of racing in the British Superbike supporting Superstock 600 championship, alongside a campaign in the Masters Supersport Championship, but date clashes saw him compete at the Masters on just two occasions. His first appearance, in April, produced three scintillating performances and a hat-trick of second place finishes, despite riding a Superstock machine against the more powerful Supersport bikes. His speed and the quality of his riding secured the ‘Young Racer of the Year’ nomination for April and a place in the October shoot-out. 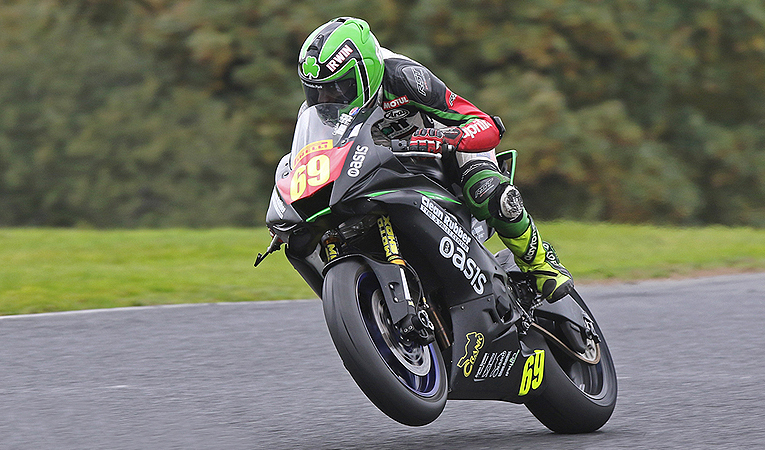 A second visit to Mondello Park in October produced another runner-up spot before the twenty year old finally took his maiden Supersport win in the second race of the weekend. When the points from all categories were totaled Irwin came out on top, ahead of what judges described as the closest and best prepared field of nominees so far, having impressed the judges across all categories and scored highest in the track skills and career portions of the assessment. Following the shoot out, the participants had to wait until Saturday night’s awards ceremony to hear the result, which was announced as the final award of the night. Jim Halligan, representing the competition judges, also had this to say about Caolán and the standard of the competition in general. “The standard was the highest we have seen so far in the competition and we believe our choice of winner should get to the very top, as will many of the nominees. But unfortunately there can only be one winner.